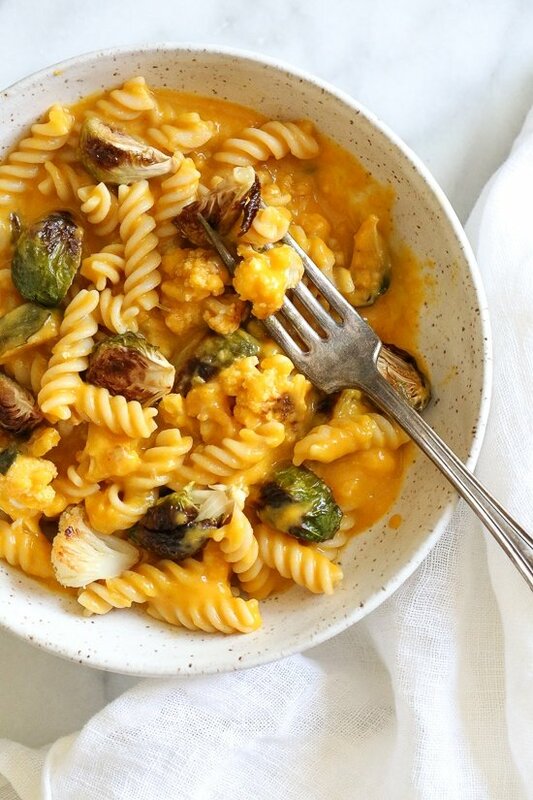 It’s October, so Pumpkin Mac and Cheese with Roasted Cauliflower and Brussels Sprouts is a must for the Fall! 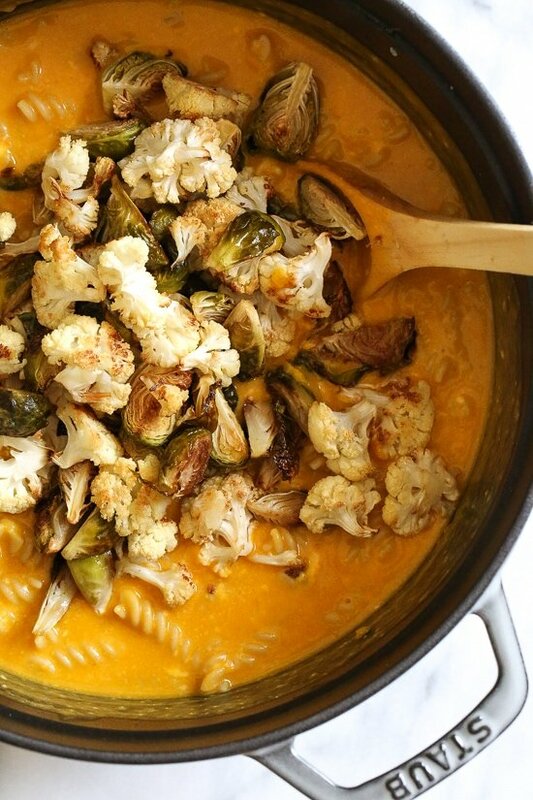 Using pumpkin puree makes a creamy light cheese sauce, without having to add too much cheese or butter. 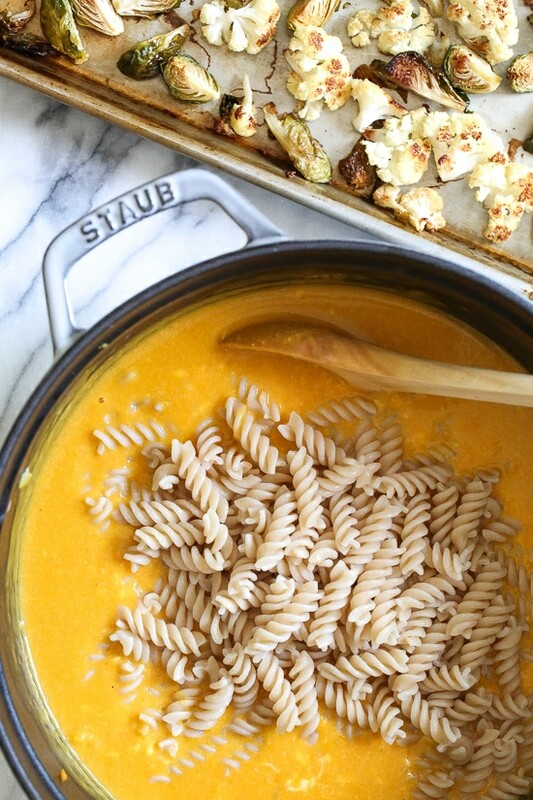 You can make your own pumpkin puree or use organic canned pumpkin to make it faster! 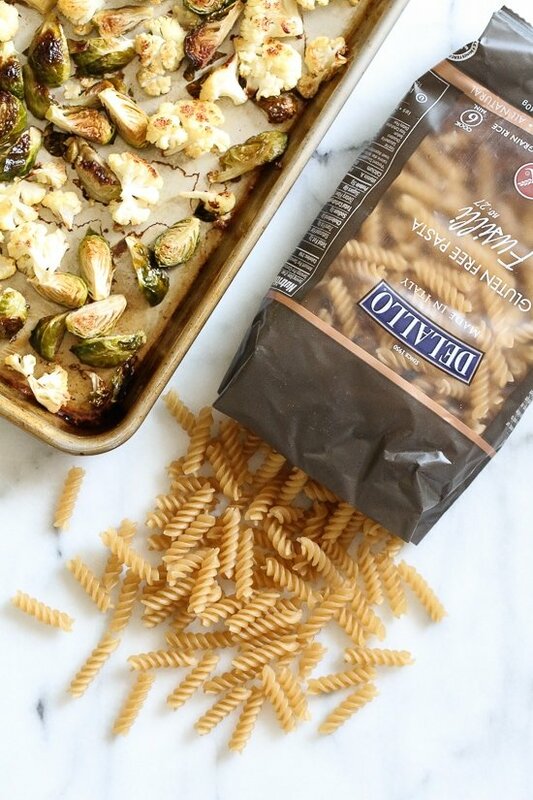 Madison loved the pasta without the roasted veggies but the rest of us loved it with. Preheat the oven to 400°. Line 2 large baking sheets with aluminum foil, and coat with olive oil spray. 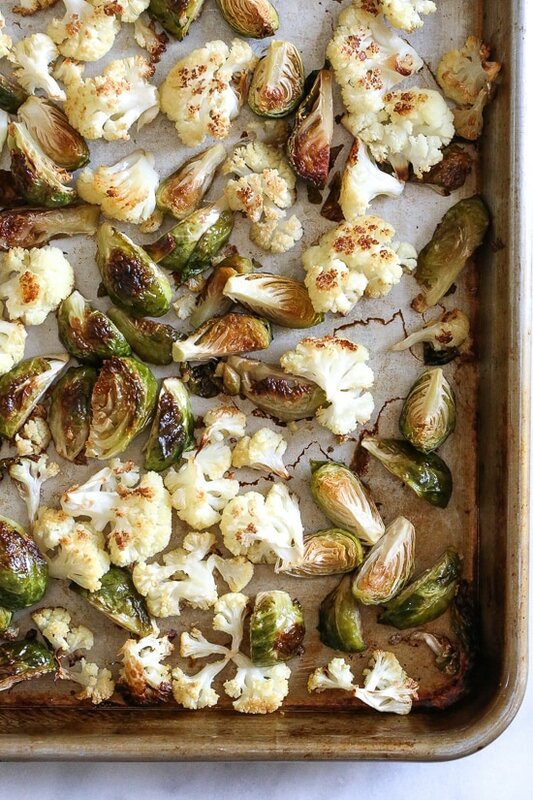 Toss cauliflower and Brussels sprouts with olive oil, and season with salt. Spread in an even layer on the prepared baking sheet. If you are roasting the pumpkin yourself, cut the top of the pumpkin as you would if you were carving a jack-o-lantern. Then cut it in quarters. Scoop out the seeds (if you wish to make roasted pumpkin seeds, rinse and lay them out on a baking sheet overnight to dry out). 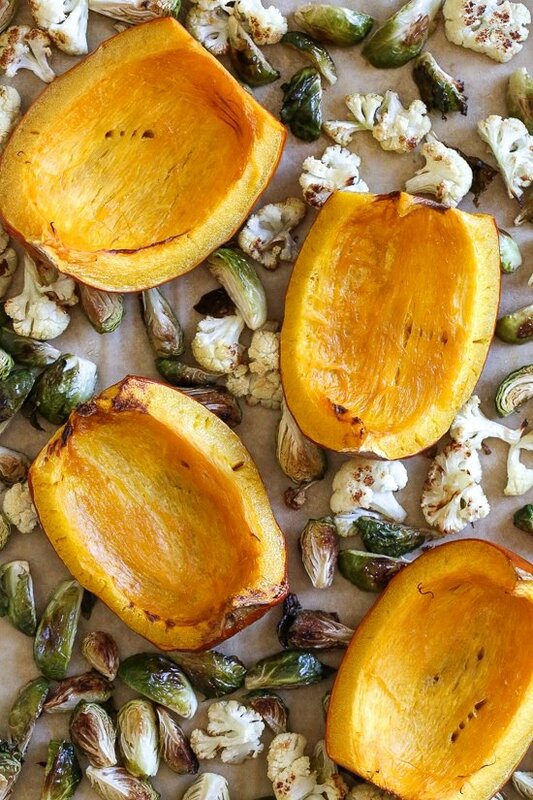 Place the pumpkin on the prepared sheet pan and roast with the other veggies in the oven at 400°F for 35 to 37 minutes, stirring the vegetables and rotating pans halfway through cooking time, until vegetables are soft and have begun to brown around the edges and the pumpkin is soft if pierced with a knife. Remove the vegetables and pumpkin from the oven, and when cool enough to handle, remove the pumpkin from the skin. This will come off easily. 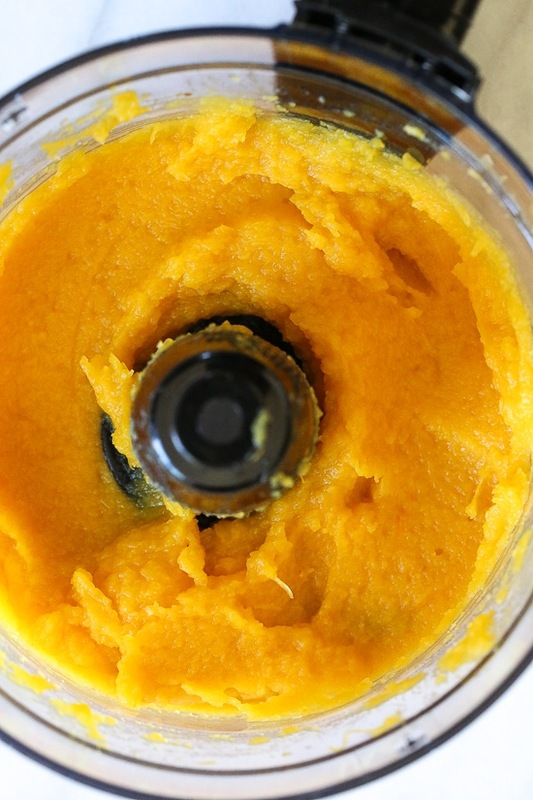 Discard the skin and place pumpkin in a food processor. 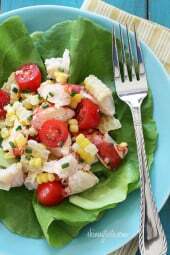 Puree until smooth, adding water by the tablespoon if needed about 3 tablespoons until smooth. 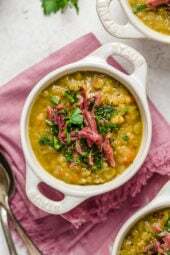 While vegetables roast, bring a large pot of salted water to a boil. Cook pasta according to package directions, omitting fat and salt. Drain, and set aside. Over medium heat melt the butter. Add the onion and cook over low heat about 2 minutes, add flour and cook another minute, or until the flour is golden and well combined. Add milk and broth and whisk, raising heat to medium-high until it comes to a boil; cook about 4 to 5 minutes until it thickens slightly. Season with 3/4 teaspoon salt, nutmeg and pepper. 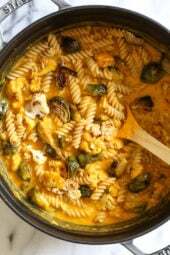 Once it begins to thicken, stir in pumpkin and cook until heated through, about 2 minutes. Remove from heat, add cheeses and parmesan and mix well until melted. 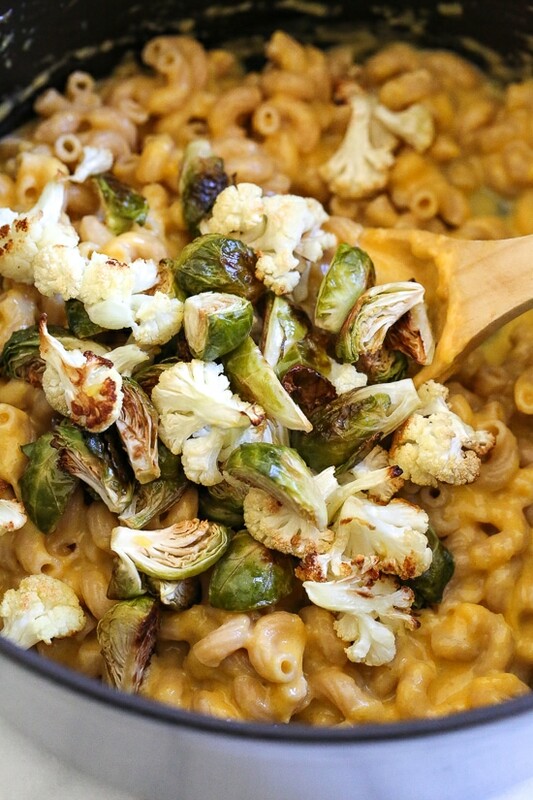 Add the cooked macaroni and mix well, fold in the roasted vegetables. 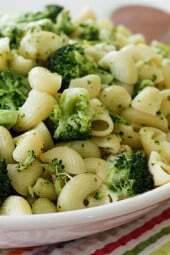 My entire family loves this recipe We do add sliced chicken sausage to the pan as well We brown in first in the cast iron skillet, then add to the cheese sauce and pasta. My daughter would eat it everyday if we let her. She has the leftovers for breakfast, not wanting to wait for lunch.